These homemade Garlic Parmesan Rolls are crusty and cheesy on the outside, and soft, fluffy and garlic-y on the inside! 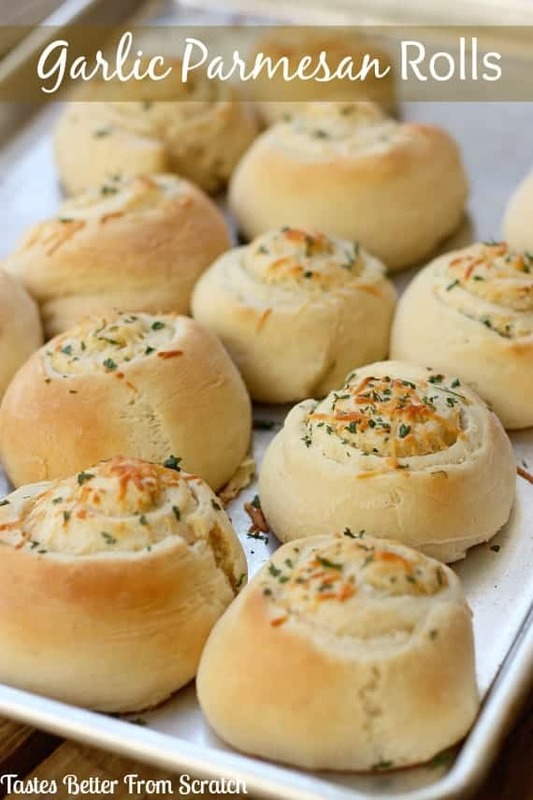 Simply put, these Garlic Parmesan Rolls are exactly what you’d hope–They’re crusty and cheesy on the outside, and soft, fluffy and garlic-y on the inside! It’s sad how quickly these vanish whenever I make a batch. As proof, you can see from my photo that the only picture I had time to take was the rolls sitting on the cooking sheet, just out of the oven! I wont blame it entirely on my husband, because I’m just as much at fault–the second these are out of the oven it’s all I can do not to scarf down at least two! Have you ever heard the phrase “weekends are for baking”? I use it all the time. Sundays are my favorite day for baking, especially for making homemade rolls! 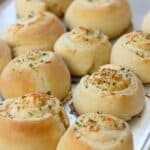 If you love homemade rolls, you should try these Garlic Knots or Perfect Dinner Rolls or these amazing Homemade Bread Bowls! The perfect dinner rolls! -- Crusty and cheesy on the outside, and fluffy and garlic-y on the inside! In a bowl of your stand mixer stir together the warm water, sugar and yeast. Let sit for 10 minutes. Add the flour, salt, and olive oil and knead (or mix with your mixer and dough hook attachment) for about 5-7 minutes or until the dough is smooth and elastic. Cover and let rise in a warm place until doubled in volume--about 1 hour. Pour dough out onto floured counter top. Roll it into a large rectangle, no more than 1/2'' thick. In a small bowl mix together the melted butter, garlic powder, parsley, and olive oil. Use a pastry brush to spread about 1/2 of this butter mixture on the dough. Sprinkle with 1/4 cup of the grated parmesan cheese. Roll the dough tightly long-ways, like a log (like you would with cinnamon rolls). Use a sharp serrated knife to cut the log into pieces about 1 1/2 inches thick. Cover rolls with plastic wrap that has been sprayed with cooking spray so it wont stick. Allow to rest for about 30 more minutes. Bake rolls at 400 degrees F for about 12-14 minutes. *At about the 9 minute mark, remove the rolls from the oven and spread the remaining butter/garlic mixture on top of them. Sprinkle with remaining 1/4 cup of fresh parmesan cheese, and return to the oven for the last few minutes of baking. Enjoy! My kids love garlic bread anything so these would be so fun to make! Thanks Amber! They’re perfect to make with kids and everyone always seems to love them! These look so good Lauren! I can’t wait to make them! Thanks Courtney! I’m salivating over your guacamole egg salad lettuce wraps! YUM! These would be perfect with what I’m making for dinner tonight! They look so yummy. They’re the perfect addition to such a variety of meals! Thanks for your comment Alli! Oh my goodness, these look soooo good! I need to make these soon! Thanks Aimee! They’re super easy and yummy! I must make these rolls for my friends. They would love them. Gorgeous photos.